Whether you’ve started one of our medical weight loss programs or not, knowing how to find a healthy meal while eating out is a valuable skill. Today’s typical restaurant meal is served in big portions, and healthy menu options can seem few and far between. However, with careful attention to the menu and the food that’s on your plate, it’s possible to eat a healthy meal at nearly any restaurant. There is no need to avoid restaurants altogether. Here are some strategies to help you stay healthy while still enjoying a night on the town. In the Internet age, you can decide what to eat before you even sit down at the table. 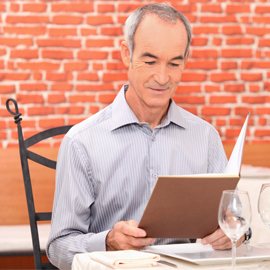 Many restaurants allow you to check their menus online, and this can help you find out if a restaurant will have something that meets your needs before you go. If you’re interested in a specific restaurant, head to their website to see if a menu is available. Sometimes, this information is available on websites like Yelp and Urbanspoon, while these sites also have reviews from other diners that can give you an idea of what to expect. In general, it’s best to look for a meal that is primarily composed of lean proteins, fruits and vegetables. Try to avoid processed carbohydrates (including desserts and sugary drinks), as well as anything served with gravy, butter or cream sauce. You’re usually better off choosing something baked, boiled, broiled, grilled, poached, roasted or steamed. Most restaurants are willing to accommodate your dietary needs to make your experience as positive as possible. If you discover that nothing on the menu will work, ask your server if you can substitute something healthier. Sharing with someone. Ask another diner to split a plate with you. This will help both of you reduce your portion size (and save some money in the process). Saving some for later. When your server brings the food, ask for a to-go box immediately. Put half of your meal in the box to keep yourself from overeating. Avoiding the entrees. If you can’t find anything healthy to eat among the main courses, consider making a meal of an appetizer or salad. Just remember to avoid fatty toppings like bacon and cheese and high-calorie sauces and dressings. If you find yourself going out to eat during medical weight loss, remember: eating in a restaurant can almost always be healthy if you make informed decisions, reduce portion sizes and communicate your needs to your server.